39% of U.S. employers report that they are having difficulty finding staff with the right skills for their organization. In construction, engineering, and supply the percentage is even higher. Companies have already begun to innovate and look for new ways to attract the right employees. What about your organization? 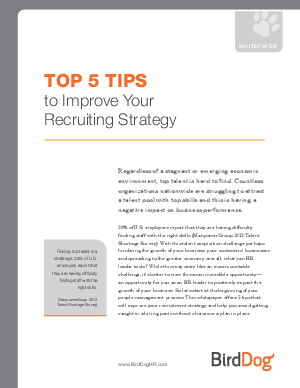 Download this whitepaper to learn about the top 5 tips to improve your recruiting strategy and see how this will allow you to properly attract top talent.